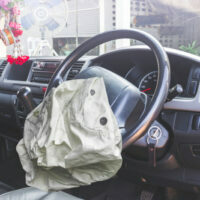 A young woman in Miami had her life affected forever due to a defective airbag in her mother’s 2002 Jeep Liberty. Reports indicate that the young woman was driving the Jeep through her neighborhood when both the driver and passenger side airbags spontaneously deployed. There was no accident, no collision; not even a speed bump. When the airbags deployed, the young woman suffered second degree burns on her arms resulting in permanent scars that required skin grafts, according to CBS Miami. This young woman is not the only victim of this disturbing defect. Three other individuals reported suffering similar injuries after the airbags on their Jeeps suddenly deployed without warning or cause. The Jeep Liberty at issue was the subject of a recall for the airbags in 2015 and notices were sent to owners by mail, but the young woman never received this notice. The young woman’s mother registered the Jeep with the state of Florida, but did not update her mailing address with the manufacturer. Filing a claim against a large manufacturer can be intimidating since many big companies have a team of defense lawyers who will do all they can to reduce or deny liability. That is why you should hire an experienced Miami product defect lawyer so that you can level the playing field. Under Florida law, manufacturers have a duty to make and market consumer products that are safe and effective when used as intended. This means a manufacturer, distributor or seller can be held liable for the harms and losses you suffered when the product is deemed to be unreasonably dangerous. To succeed in a product liability lawsuit, the plaintiff (i.e. you) need to prove the following legal elements to establish, by a preponderance of the evidence, that the defendant was negligent and therefore liable for your injuries. Defective Product – your attorney needs to present evidence showing that the product was defectively designed or manufactured or that the manufacturer knew or should have known of the safety risks and failed to warn people. Proximate Causation – your attorney needs to show that the defect in the product was the cause of you or your loved one’s injuries. Actual Damages – your attorney needs to show that you suffered damage as a result of the defect. Damages are usually substantiated by presenting medical cost invoices, wage statements, and other evidence. You Used the Product as Intended – this is extremely important because evidence of misuse or improper use creates a defense for the defendant to claim that they should not be held liable when you used the product not as it was intended. If you or a family member was seriously injured by a defective product, you need experienced legal counsel to help guide you through the complex litigation process. The Miami product liability lawyers at the office of Alan Goldfarb, P.A. are here to help. Contact our office today to schedule a free, confidential consultation with one of our personal injury attorneys.